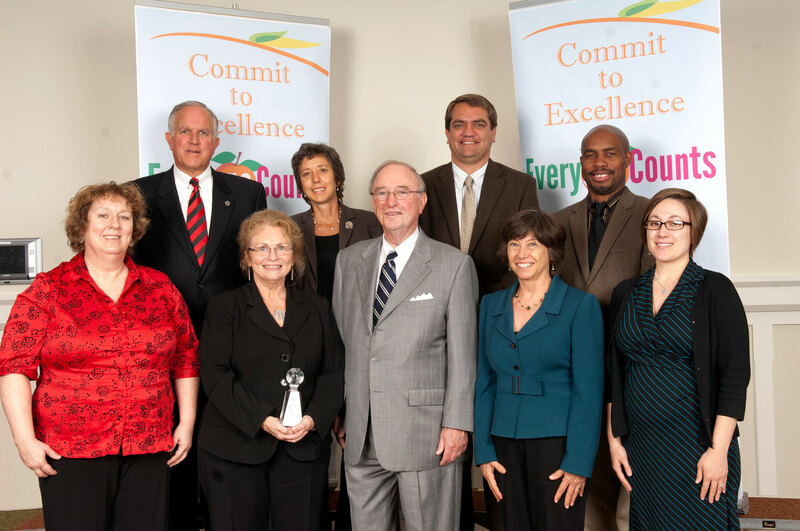 Staff members in UGA’s Career Center, Health Center and Disability Resource Center were recognized by Chancellor Hank Huckaby in an Oct. 3 ceremony at Clayton State University. The teams collectively received two silver and one bronze Chancellor’s Customer Service Awards. The annual customer service awards were created to honor employees who have gone “above and beyond” their normal job responsibilities in helping their internal and external customers and in consistently promoting service excellence. Colleges and universities in Georgia submitted several hundred nominations. The University Career Center took home the silver in the team category for its service to more than 10,000 individual students per year. Services they provide include online résumé creation tools and in-person critiques, Intern for a Day program, interview preparation and practice, academic advising certification program, 12 career fairs a year and integrated mobile technology. Team members are Bethany Bagley, Shaistha Begum, Penny Benton, Aaron Brown, Michelle Carter, Andrew Crain, Vassi Deltcheva, Megan Flora, Holly Getchell, LeAnn Golob, Kendra Goode, Debi Grayson, Marian Wells Higgins, Nicole Lechene, Laura Ledgerwood, Lisa Lowe, Darin Parker, Charles Perry, Christie Sanders and Kelley Whisnant with Scott T. Williams as team lead. 68-day waiting list for appointments and increased capacity for client visits from 6,300 to 7,200 a year. Team members are Heather Buffington, Kelly Case-Simonson, Tricia Coghlan, Danneel Hubbell, David Lester and Chuck Zanone with Gayle Robbins as team lead. Disability coordinators at the University Disability Resource Center received the bronze in the team category. In fall 2011, they created the “Coordinator of the Day” process as a way to prioritize and manage incoming calls and requests. The coordinators each serve a caseload of more than 100 students, staff answer more than 24,000 calls a year and walk-in visits generate about 500 new case files a year. The coordinator initiative allowed the team to manage this volume and receive a 98 percent “complete satisfaction” rate on its 2012 customer survey. Team members are David Anderson, Carolyn Arnold, Peter Bertot, Tim Carr, Susan Cates, Daley Connelly, Angela Cote, Donald Dicer, Teresa Edwards, Norford Fahie, Dale Gibson, Amanda Hales, Leigh Jagor, Karen Kalivoda, Sarah Kesler, Molli Scarborough, Diane Shimkets, Marielle Stair, Carla Topp and Margaret Totty with Pat Marshall as team lead. Also, the University Parking Services team received an honorable mention in the outstanding customer service improvement initiative award category for its Operation Safedrive, a free vehicle inspection program. The initiative increases driving safety and promotes university goodwill. Hundreds of students lined up to have their vehicles inspected to help them get home safely for the Thanksgiving holiday in 2011. The team—which includes all parking services staff—is led by Don Walter.